Do facts clearly show that some conspire against thought to be rugby schools? Are teams victims of misfortune? The real truth could be that defeat was at least partly self-inflicted, and not the result of a conspiracy. Try telling this to people who wear blinkers and they don’t see anything good when a decision goes against you. Goebbels said, “Tell a lie a hundred times and it becomes the truth.” It is a fad to keep saying things and post on social media however trivial the action could be to alter the result of a match. Like the political circus where few care a damn. A typical call of why did you not connive was heard after St. Joseph’s played Kingswood at Bogambara last week. The referee consulted the Assistant Referee (AR) before awarding a corner flag try. After the match a spectator walks to the AR and says you are from Kandy and you should have said no try. He was told the match is over and the hosts asked him to leave the ground as he should not be there. The immediate reply was, “We as spectators have a right to question the referee. You too have a right to referee why not try your hand.” was the answer he got. After lapses Trinity, the hosts last week took all necessary steps to secure the referee. They have installed security cameras to enable track culprits. That is the positive part of Trinity Administration. Spectators have a habit of getting into the playing area no sooner the final whistle is blown and some want to accost match officials. Maybe soon you might have to have an electric security fence to prevent spectators converging on the filed after the match. For a start why not turn on the sprinklers? After the Royal-St Peters match played at the Royal complex a spectator walks to the referee, puts his hand around and offers a bottle of water and then makes abusive remarks. All this while people thought he was a friend of the referee till the body language indicated that it was an unwanted intrusion. Who this is and who he supports is on social media. The real issue is that some overgrown babies need to be treated for mental illness. On social media you may find many clips on a referee decision and continue to discuss when the match has been over and some are marginal issues or those that are interpreted wrong. The crux is that there is a conspiracy. They cast aspersions on others who have a say in things. Probably this is based on the thinking of what they would do if they were in that position. The story of conspiracy it appears is an ingrained part of our culture that would baffle even the father of modern conflict theories “Johannes Galtung”. At a point he says : Once upon a time, during the Han dynasty, there was a man who was a dealer in weapons, somewhere in China. In his store were the means of attack as well as the means of defense, and among them a halberd and a shield. The man, the dealer in arms, had anticipated not only modern patterns of advertising, but also the modern arms race with its ballistic missiles, its anti-ballistic missiles and anti-anti-ballistic missiles, and had two posters. One advertised his halberd: This halberd is so sharp that it can pierce any shield! The other advertised his shield: This shield is so strong that no halberd can pierce it! The gap between referees, coaches, and fans are widening. One part may blame the referees. The referees blame the narrow thinking. If we talk to a coach or a fan of another playing team they are influenced. Unless this nonsense is stopped we can only see the gap widening and rugby falling go a bottomless pit. It was not long ago that a referee traveled with a Colombo coach to Kandy and had lunch with the coach of the Kandy team and proceeded to the ground. Do it now and there will be pictures on face book. It is all because of a loss of values; who is to be blamed. Is it the new schools who have taken to the game or the established who are losing the dominating position? Whether it is the Bond Issue, Floods, Fire at the Salawa, Landslides or a No Ball in a cricket: we weave a story of conspiracy. Flying a flag over a balcony to show solidarity is much better than verbal or physical abuse. But tell me how many decisions or actions inflicted by our own went against Sri Lanka such as dropping a crucial catch which showed a degree of incompetence. Could we say that the umpire conspired to call a no ball knowing that the ball will shatter the stumps? 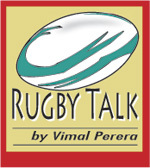 The story is representative of a culture that is taking place in all sports and all types of life in Sri Lanka. One coach summarised: We practice almost daily but in eighty minutes of a match we drop the ball or throw it forward. Tackles are missed, easy conversions are flopped,and dangerous tackles are dished out and get penalised at the breakdown. Coaching is a difficult task as players are molded by parents, old boys and other advisory body members who make the players believe that the matches are lost because of referees. Matches are lost more by the mistakes of players and referees are just a minute part of the problem. I may add that what a referee could have done when a player runs 105 meters and scores. I was confronted with a question about 50 penalties against Trinity in the match with Science. Then stoppages include 50 penalties against Trinity and a pessimistic 10 for Trinity. On an average a match has 20 scrums and 20 line-outs making a total of 100. If each stoppage takes 45 seconds it is 75 minutes. In this match there were 4 tries and 1 penalty in aggregate which would take more than 6minutes. If you add this to the 75 minutes then there has been no play on the field.